At least 3,000 taxpayers have fallen for the IRS scam, handing over more than $14 million in cash and cards. As April 15 approaches, the U.S. Treasury Department is issuing a new warning about a scam targeting taxpayers in Southern California and around the nation. The NBC4 I-Team reported on the scam last year. Thousands of people have received calls from strangers who claim to be IRS agents, threatening legal action — including jail time — if the victim doesn't send cash or prepaid debit cards for unresolved federal debt. Investigators say the calls are escalating: so far, more than 250,000 people have reported these calls; at least 3,000 taxpayers have fallen for the trick, handing over more than $14 million in cash and cards. Californians make up the largest percentage of victims in the country. 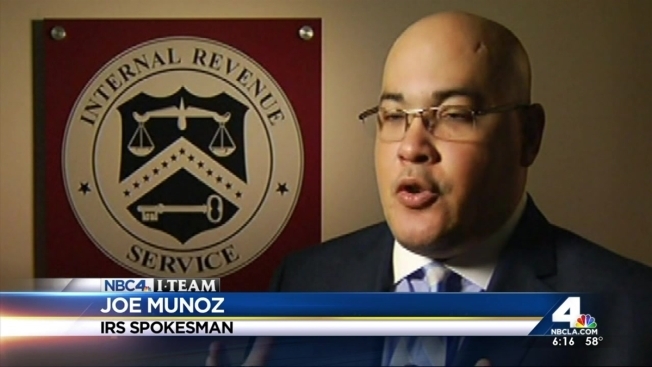 "As soon as someone pretending to be [with the] IRS [tells] you that you owe money, and if you don't pay you're going to be arrested," said Internal Revenue spokesman Joe Munoz. "That's a clear sign that it's not the IRS who is on the phone." With the scam spreading even faster than before, the Treasury Department is urging people not to engage with these callers. Instead, they should hang up immediately and file a report with the government. To make reporting easier, the government has created an online form where consumers can describe what happened, and detail any financial losses. Any information submitted will be secured with a five-digit pin code that will be permanently assigned to the case.